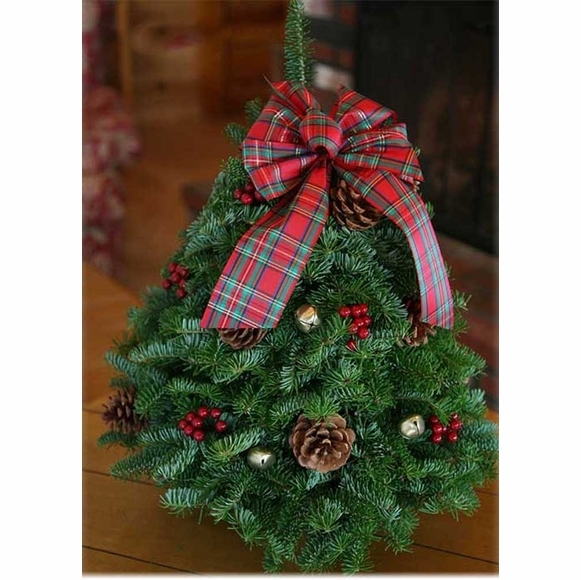 Live Decorated Balsam Tabletop Christmas Tree - - Small living balsam tree just the right size to add holiday spirit to a table, dining room sideboard, or bedroom bureau. Our miniature Christmas trees come from Maine. Tabletop tree made of fresh, fragrant Maine balsam greens. 18" high highland tree decorated with real pinecones, faux holly berries, golden jingle bells,and a hand-tied, weatherproof, Highland plaid bow. Shown in main image. 28" high lighted tree elegantly adorned with a beautiful hand-tied ivory and gold glittered bow, real frosted pine cones, faux ivory berries, and softly shimmering golden holiday balls. Lit with a string of 35 white Christmas lights (wall plug). Shown in small image on right above, click on it to enlarge. Floral foam center for watering keeps your tree fresh for the entire holiday season. Note: Trees are individually decorated by hand and may vary from the images shown. Some clients refer to this item as our small live decorated Christmas trees delivered. Even though this type of tree is known as live, it does not include it's roots; if you want a Christmas Tree with roots you will be disappointed with your purchase. The small, decorated Christmas tree purchased for a somewhat senior and mostly home bound close friend in Florida (now the third year) arrived in great shape. She was able to remove it from the box and position it on her bedroom window where it remains. She loves it still and has thanked us multiple times since. Great Christmas gift that continues to give. The tree was lovely and lasted well through Christmas. Worth the price. This is not a tree. This is a cone of florist foam with a bunch of balsam branches stuck in. Very thick and very vertical. It never relaxed enough to resemble a tree. Water instructions said to water like a plant, however water from the bottom will not wick up florist foam and the top branches dried out after a couple of days with needles shedding all over the place. It was nicely decorated, but for the money, I'll never order another. The Balsam Tabletop arrived as described. Very nicely decorated, lighted, sized/shaped. Great start. The watering instructions are troublesome (pour a lot of water directly over the tree the first two days - and subsequent days after that). And even though we followed the watering instructions, needles rained down constantly. I don't think the tree lasted two weeks before we threw it out. Definitely not worth the money. I purchased this tree for family family that was unable to set up their own tree or decorate due to recent illness. It arrived on time, fresh and with all the decorations and lights as described. They were delighted and it was such a joy to hear how pleased they were to receive it. I felt wonderful knowing that I was able to spread some Christmas cheer to them! Thank you for making this high quality product available...I highly recommend! I was very pleased with the table top Christmas tree. It was very fresh, full and a good height. I would say the product was better than expected and I would buy from then again. Received our tree today. It is absolutely beautiful. We could not be more pleased. Will definitely order again next year. I purchased the 28" decorated live tree for Christmas and loved it! The tree was very healthy and the decorations were beautiful to look at.